The quote "spending like a drunken sailor" has morphed recently into the new quote "spending like a drunken Congressmen." As key Congressional leaders meet with Treasury Secretary Paulson and Fed Chairman Bernake, news is leaking to the public about plan(s) to avert the next Great Depression. News of several plans tied together with recent emergency spending point to a near term 14-17% increase in our national debt. The first part of any plan will involve Congress raising our national debt ceiling to 11.3 trillion. The plan will also include the buyout of $700 billion in bad mortgage debt (sources: AFP, NY Times). (5.) $87 billion to JP Morgan Chase (JPM) to underpin trades with bankrupt units of Lehman Brothers (LEHMQ.PK). (9.) $50 billion to ensure money market mutual funds (Source 2,9). That's about $240 billion over the previously discussed $11.3 trillion. I guess Congress expects to recoup some funds through the warrants / equity stakes it is taking in the bailed out companies. All of this is back of the envelope math. It ignores the FDIC bailout of banks which supposedly should be covered by insurance premiums FDIC banks are paying to the Treasury. Please let me know if you've figured out anything else with more accuracy. If you do, you'll see that our nation has between $44 and $50 trillion in unfunded liabilities (much of it coming from social entitlement programs). 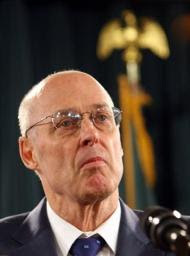 Two articles quoting the Former Comptroller General David Walker include this Seattle Politics Examiner article and a more dire website posting here. What Else Could $700 Billion Buy / Do?